The Maharashtra Public Service Commission has recently released notification and invited candidates to fill 155 posts. 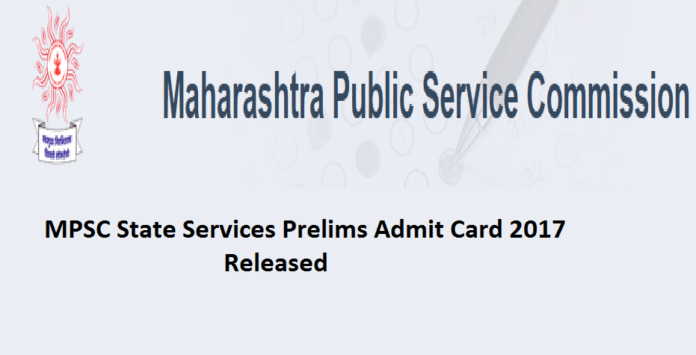 Now, they have released MPSC State Service Prelims Admit Card 2017. Authorities are going to conduct preliminary exam on 2nd April 2017. Candidates those who are going to participate in the written test may download the Maharashtra State Service Hall Ticket from official web portal at mahampsc.mahaonline.gov.in. A massive number of people applied for State Services Exam 2017. Maharashtra Public Service Commission (MPSC) was established under Article 315 of the Constitution of India. The Headquarter is located in Mumbai. It conducts recruitment process of Civil Jobs and also for Group A and Group B Posts every year. According to this information a few days back, MPSC State Services Notification 2017 disclosed for 155 Vacancies. Applicants are supposed to download MPSC State Service Prelims Admit Card 2017 from the online portal at mahampsc.mahaonline.gov.in. Preliminary test will conduct for various designations like Asst Commissioner Grade A, Dy.Chief Executive Officer Gr A, State Superintendent Gr B, Tahasildar Gr A, Asst Regional Transport Officer, Divisional Officer, Asst Group Development Officer, etc. As per the schedule test is on April 2, 2017. Applicants must make a note that in the MPSC State Service Preliminary Call Letter 2017 necessary details like name, roll number, exam dates, photo and address will be available. Even instructions like no mobile phones and Calculator will allow into the exam venue. Soon after downloading MPSC State Service Prelims Admit Card 2017 candidates must start preparing for the exam. It consists of Objective Type Questions. There are two papers. Paper, I is for 200 marks and Paper II is for 200 Marks. The time duration is 2 Hours. Well coming to the point, it is compulsory to check the MPSC State Services Pre Exam Dates. Before one hour make your presence at the exam venue and do the exam well. Qualifying candidates may call for next round of Main Exam. Hence, the active link of admit card is given at the end. Follow Techfactslive.com for latest updates like Recruitment, Admissions and Board Results.